Inner Rambling of a Mid Life Mama. : Superior Scribbler Award...and Fabulous too!!! Oh My!!!! look at this, an award!!! I am so humbled. I actually got this last week but have been so busy with real world stuff it's taken me this long to do it justice. Tori over at Not In Kalamazoo Anymore sent this to me and I have to say I am touched. Go and check her out immediately, she's so witty and down to earth and just tickles me! She also has a very cute puppy and apparently he can drive....he can....there's a picture to prove it (a coffee spitting moment!). 1) Post it on my blog together with the name of the person who has granted the award and his/her blog link, as well as a link to This Post from the original Superior Scribbler! 2) Pass the award to 5 most-deserving Bloggy Friends. Remember to contact the bloggers to let them know they have been chosen for this award. 3) Add your link to the list of Superior Scribbler Awardees. This will promote your blog AND officially add you as a luminous Superior Scribbler! 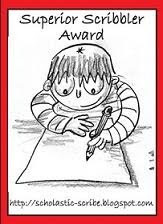 Choosing five bloggers to pass this award to is like choosing a favorite from your children, totally impossible, i love you all but there are some who deserve extra acknowledgement just 'cos dems da rules!!! Beth of Be Yourself, Everyone else is taken, her blog is so graceful and peaceful. I love the way in which she writes like poetry and is so creative with words and pictures. Shannon at Recovery from a life not lived, Shannon has the biggest heart in the world even if she doesn't realize it! I love her posts and leave feeling.. wow!!! She's honest, gutsy and very funny.... and i got to meet her...neerreeererererreeeerrr (or however that goes). Jane at Spain Daily, she's more of a Superior Jotter than a scribbler, she's a blogger of not so many words but gets you thinking. Her pictures are fabulous too and she's a catalyst for many an online discussion. Just Superior all round. I am sure if you follow me or read my blog you'll know that I am also BFF with Spudballoo at Chez Spud . Now there's a gal... she will make you laugh, tug at your heart, enlighten you and fill you with joy or reduce you to tears. Her scribblings are amazing and so is her photography. I learn a lot from Spud, she's my homie, I consider her my link to reality. Last but absolutely not least is Michel of Facts Are Strickly Optional for some of the bestest, dry humor in the blogoshere you need to head on over and see what she has to say. Her writing it hilarious and there's almost always a wtf moment!!! She probably jumps out of bed in the morning and says wtf before anything else!!! So my dear friends... take the award... do what you will with it and just keep blogging, just keep blogging!!!!! p.s. i also received a fabulous award this week and will post on it later seeing as this is so long. All great choices! I think that two of them, I don't know. I will go check them out! I think you'll like them...if I do say so myself!!! JUST SPIT MY FREAKING WINE ALL OVER MY KEYBOARD!!! YOU ARE THE FREAKING BEST WOMAN AND I SERIOUSLY LOVE LOVE LOVE HEART LOVE YA!! XX00 AND ALL THAT TOO! ps- shut the hell up about my britches. It's you're stinking fault I'm gaining weight. Yours and Sara's damn it. Don't believe me? Ask her about the 3rd law of Thermodynamics!!! Um third law of what??? all i know is the third law of icecream! How the hell have i never been to this blog!?! It talks about ME and everything! Those are my FAVORITES!